The Japanese-Language Proficiency Test (JLPT) is largest-scale Japanese language test in the world. Since 1984, the Japan Foundation and Japan Educational Exchanges and Services have continued to offer the JLPT as a reliable means of evaluating the Japanese proficiency of non-native speakers. The JLPT is widely recognised across corporate and government sectors as a benchmark for proficiency measurement, and is also a strong motivator for students of Japanese language. To be announced. Follow us on social media and/or subscribe to our newsletters for updates. 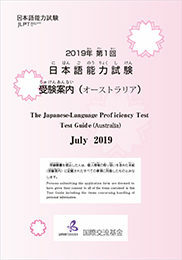 You must read the JLPT Test Guide before submitting your application. Early June. Approximately 1 month before the Test. If you fail to inform us of changes to your postal address by the time of postage, then you risk misdelivery of your results. Early November. Approximately 1 month before the Test.